The Flamenco performances take place at different times based on the selected option between 6 pm and 9 pm. We are comparing Flamenco Evening Show at Tablao de Carmen Prices from leading ticket suppliers and Try to find you Cheap tickets prices on the market. A traditional Spanish cultural performance expressing the nation's passion through the guitar music and artistic dance. A chance to feel the rhythm of one of the world's most popular dances in an authentic ambiance of Tablao de Carmen. An opportunity to familiarize yourself with the Spanish cultural legacy by visiting the Spanish Village. Dancing event accompanied with a drink or meal. Attending the Flamenco show is a must for a better understanding of the Spanish people. A tour of the Spanish Village introduces the traditional and cultural side of the Spanish nation. Both the show and the tour are suitable for adults and children. Your Experience With Flamenco Evening Show at Tablao de Carmen? Admire the rhythm of the Flamenco music and witness the passion of professional dancers of this lively dance. Visit the Spanish Village before the scheduled performance, for which you benefit from free entrance starting from 4 pm. Have tapas or other culinary specialties of the Spanish cuisine before the spectacle. Enjoy the atmosphere and architecture of Tablao de Carmen. 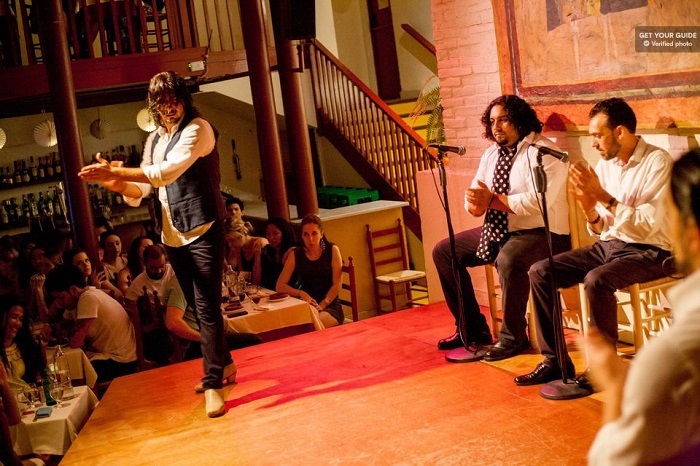 What Flamenco Evening Show at Tablao de Carmen Includes? A free entrance to the Spanish Village (Poble Espanyol) after 4 pm on the same day. Dancing performance accompanied with a drink or dinner based on the option you select. Travelers Reviews about Flamenco Evening Show at Tablao de Carmen? The vast majority of attendants enjoyed the atmosphere at Tablao de Carmen and the way the dance went on. The largest number of travelers who ordered a meal rated served food as excellent or OK at the very least. Guests of the tablao have a high opinion about the professionalism and performance of the musicians and dancers. Some of them rated a visit to Tablao de Carmen as a romantic experience. Finally, guests think of the show as of an authentic one. Tablao de Carmen is accessible to people with special needs. Printed and mobile vouchers are valid for attending the show. Depending on the selected provider, you can get a full refund for cancellations one day in advance or none at all.